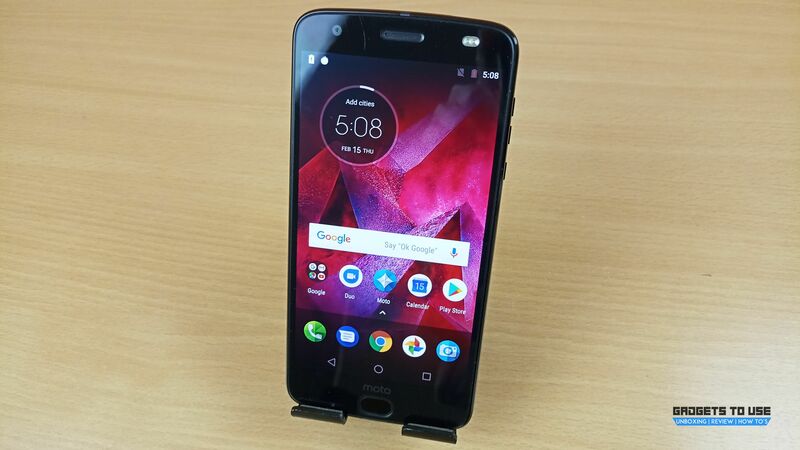 Motorola released its latest smartphone the Moto Z2 Force a few days ago in India. The Moto Z2 Force is Motorola’s latest flagship smartphone and comes with the latest hardware which makes it worthy of competition with the popular OnePlus 5T. 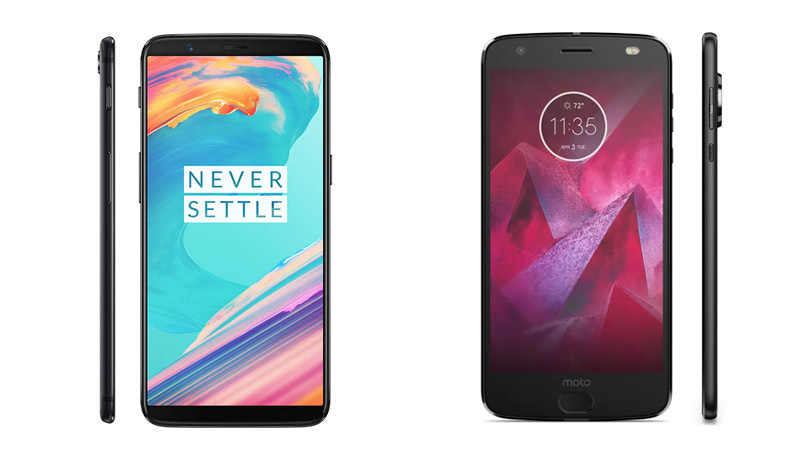 With companies like Motorola and OnePlus offering flagship killer smartphones with near stock Android, consumers have never had it as good as they do right now. 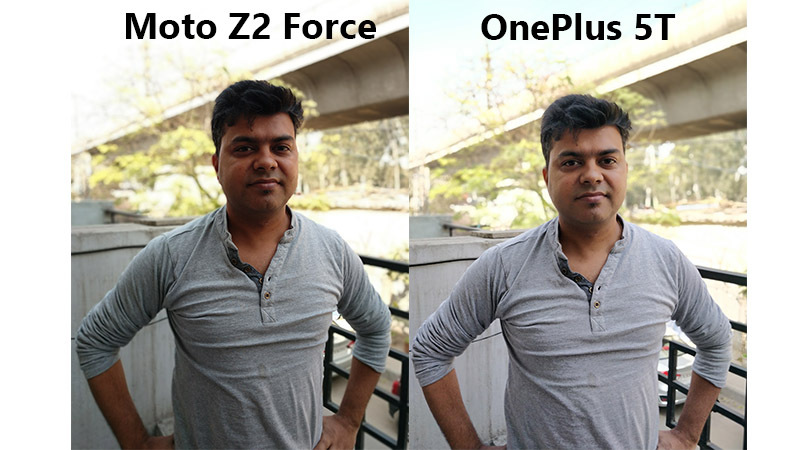 In this post, we are going to compare the Moto Z2 Force and the OnePlus 5T in terms of the design, display quality, cameras and overall performance. In case you missed it, the Moto Z2 Force is available for purchase at Rs. 34,999, and comes with a free Moto TurboPower mod worth Rs. 5,999. The OnePlus 5T, on the other hand, starts at Rs. 32,999. 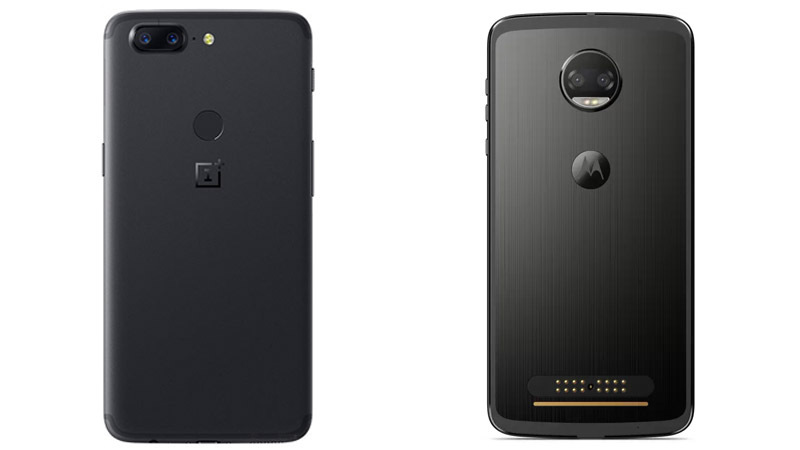 Moto Z2 Force comes with a dual camera setup just like the OnePlus 5T, but it comes with better hardware (according to the specs sheet). Moto Z2 Force comes with 12MP + 12MP sensors, one of which is a Monochrome and other one is an RGB sensor. 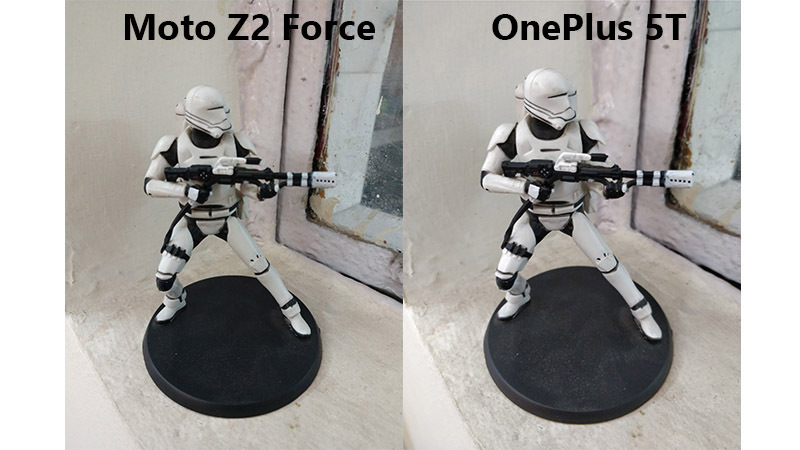 The aperture on both the sensors is f/2.0 which captures some good pictures in artificial and low light condition, but it shows some grains. The colors look oversaturated in the photographs clicked with this smartphone, the details in the pictures are great, but overall the photos didn’t look so great. There are a selective focus and the selective Black and White mode. Moto Z2 Force can shoot 4K videos at 30 fps, but it lacks any kind of stabilization. 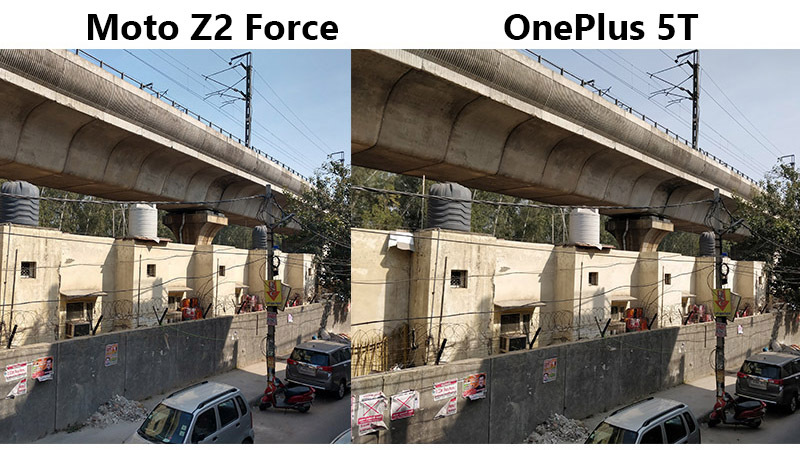 OnePlus 5T, on the other hand, used a wide angle lens in its dual camera setup which can optically zoom up to 2X and also can add depth to the pictures. The smartphone comes with a f/1.7 aperture for best results in low light conditions. The photos are well lit, and the colors are perfect, there are no grains scenes in the pictures, and the details are excellent. The portrait mode also works perfectly in well-lit conditions. 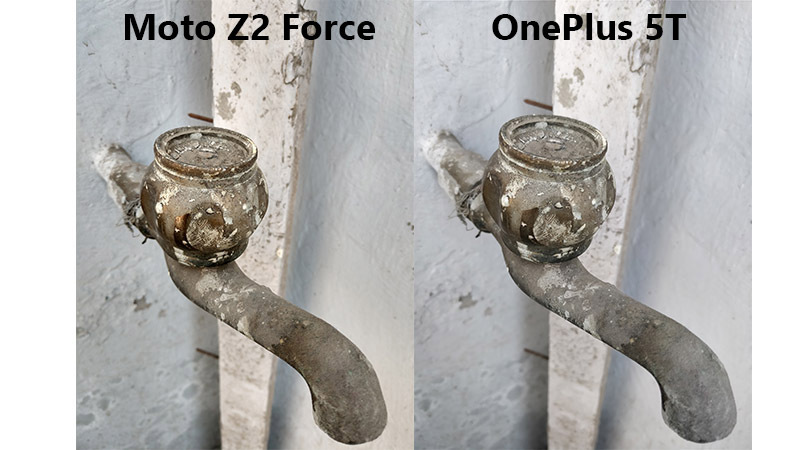 The OnePlus 5T cam record 4K videos at 30 fps and it comes with gyro EIS stabilization. The selfie camera is a 16MP sensor which captures excellent pictures with a little depth in them. OnePlus 5T comes with a 6-inch FHD+ display with 18:9 aspect ratio. The screen is Optic AMOLED, and it is protected by Corning Gorilla Glass 5. 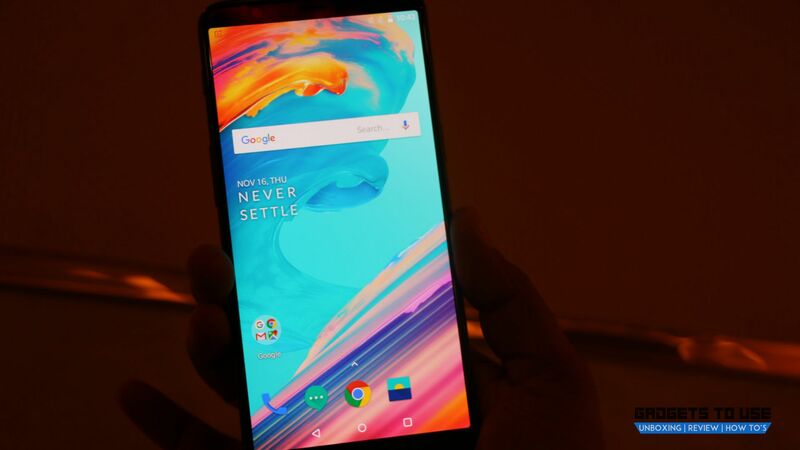 The display experience is precisely similar to the one we saw on its predecessor OnePlus 5; the only difference is that the display on OnePlus 5T comes with 18:9 aspect ratio. The Moto Z2 Force comes with 5.5 inches P-OLED display which comes with 16:9 aspect ratio. The screen comes with QHD resolution and itis protected by Motorola’s Shatterproof protection, Motorola even provides four years of warranty on this display. The display experience is excellent; the outdoor experience is also excellent. OnePlus 5T comes with a Qualcomm Snapdragon 835 processor with 8GB/ 6GB RAM, and the smartphone is super fast whether it is high graphics gaming or multitasking. No app refreshes in the background as there is plenty of RAM left for that. The smartphone can even multitask a few high-end games. The OS also provides the seamless performance, and the interface is smooth as well. Moto Z2 Force also comes with the same hardware, it features the Qualcomm Snapdragon 835 processor, but it comes in only 6GB RAM variant. The performance is not an issue here too because the Moto Z2 Force comes with stock Android 8.0 Oreo, it comes with a few apps from Moto, but overall the experience is swift and super smooth. The multitasking and gaming is not a lot of difference between these two smartphones because of both shares the same type of hardware. 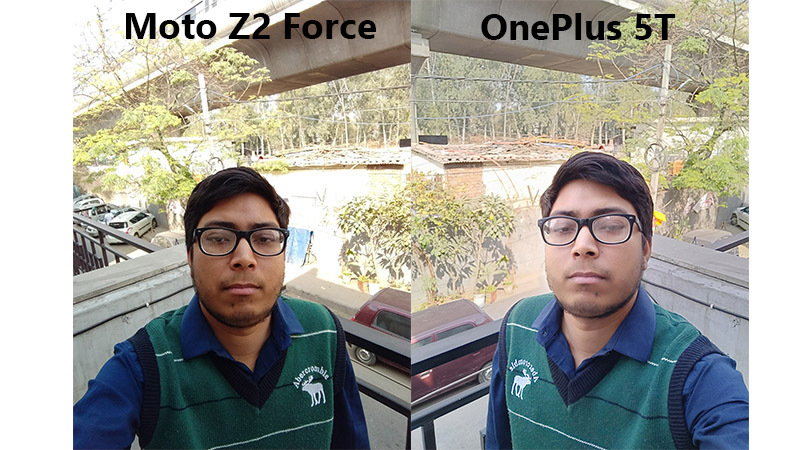 Moto Z2 Force and OnePlus 5T both derive the same model as their predecessors except for the fact that the OnePlus 5T comes with an 18:9 aspect ratio. The Moto Z2 Force is still featuring a 16:9 display with the thick bezel on the top and at the bottom of the screen. The Moto Z2 has a metal unibody design with the super thin body (6.1 mm). The phone feels sleek in hands, it is almost slippery, but it fits perfectly in hands. There is a bump at the back of the phone for the camera module, and when you are not using a mod, it feels a bit off when putting it on a flat surface. The OnePlus 5T also derives the same design from the OnePlus 5 smartphone, but this time the front display bezels are thin which provides a great look. The fingerprint sensor moved to the back, and the navigation bar is now a software-based navbar. The OnePlus 5T is also a slim smartphone, not as thin as the Moto Z2 Force but at least it is not at all slippery in hands. 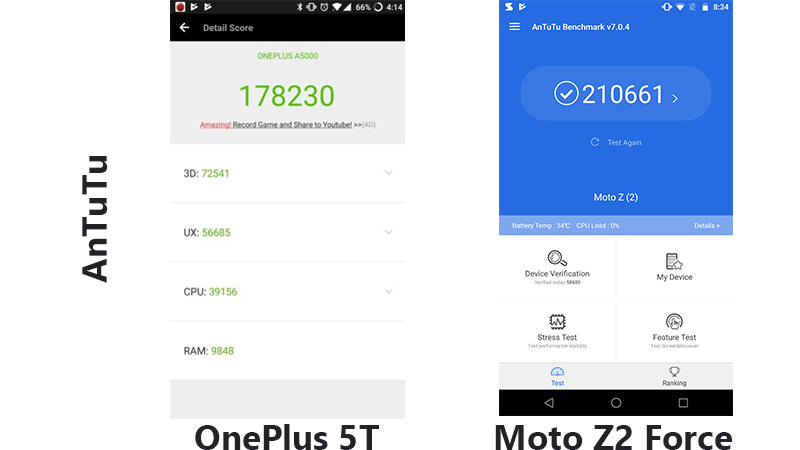 The OnePlus 5T and Moto Z2 Force compete really well with each other – the only thing which makes the OnePlus 5T winner here is the 18:9 aspect ratio display. The Moto Z2 Force still features the old 16:9 screen which is becoming an obsolete feature. 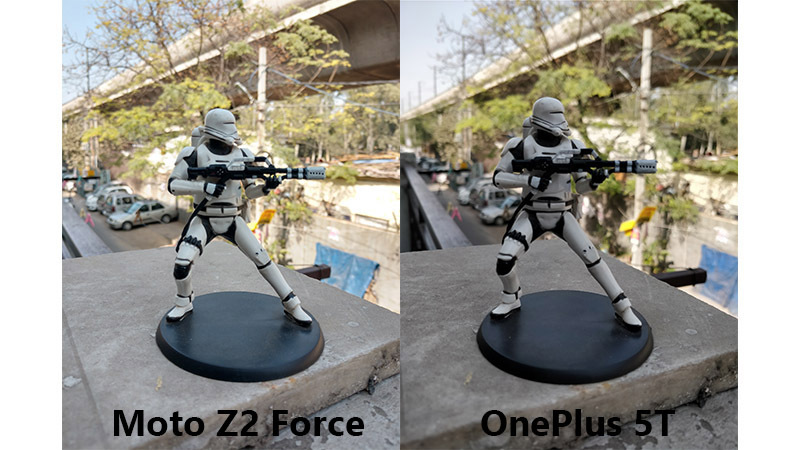 The camera of OnePLus 5T is also a lot better that OnePlus 5T. Now you have everything here, and you can decide which option is better for you.